It’s that time of year again! Lists of sight words and spelling words will be coming home soon, if they aren’t already. I had a blast the past two years finding ways to make sight word and spelling word practice fun. This year will be no different. 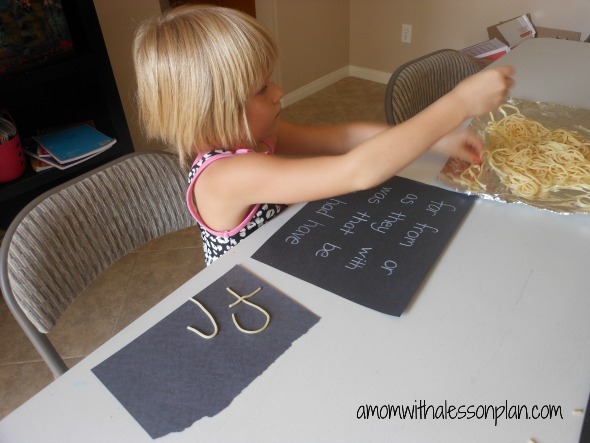 In keeping with this week’s lesson plan of food, we used cooked spaghetti to practice Little M’s sight words. I cooked the pasta ahead of time so that it would be cooled for the activity. I will admit that this one didn’t go over as well as I would have liked. I figured I’d still pass it on, it’s probably an awesome activity for someone out there. If your little one likes the sensory experience of spaghetti this would be perfect for them. I had already written the words she need to practice on a piece of paper. My plan was to have her place the noodles on the words as they were. The letters were way too small, so we had to improvise. I gave her another piece of paper and had her read the words to me. When she got stuck on one, I said it out loud, had her repeat it and then asked her to “write” the letter with spaghetti on another paper. 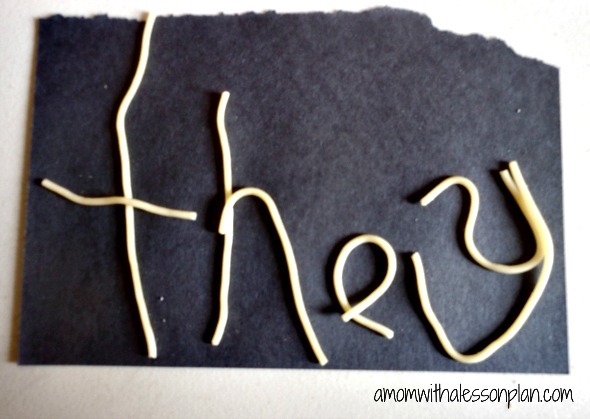 To use this activity for spelling words, start the same way. Have you kids copy the words then clear the space. 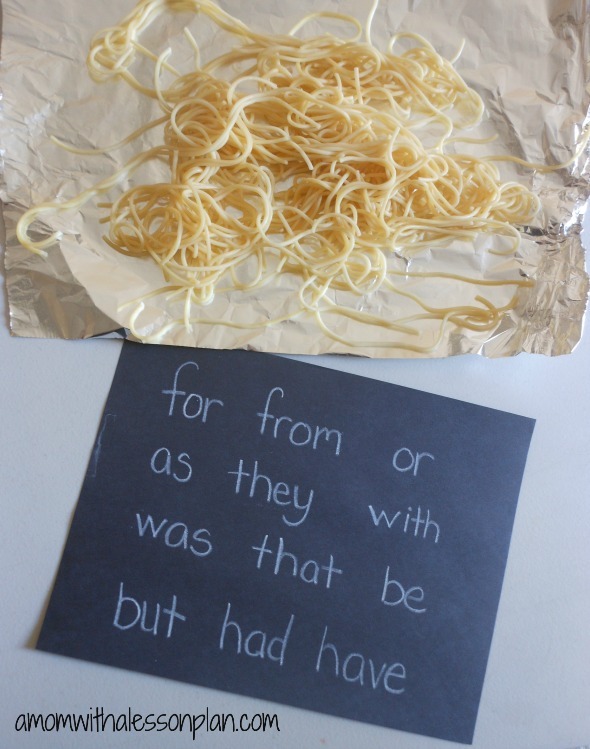 Read the words out loud and have them spell them out with spaghetti without seeing them written. Have you started working on sight or spelling words yet? What a fun and unique way to work on this skill! I think it is perfect for kids who are reluctant to write and “just want to play”. Perfect! They can play (and learn of course) while you cook. YAY!!! I love activities that we can ACTUALLY do. 😉 Simple is best. Will do! Thanks for the invite. I have watched your site from time to time and have used a number of things. 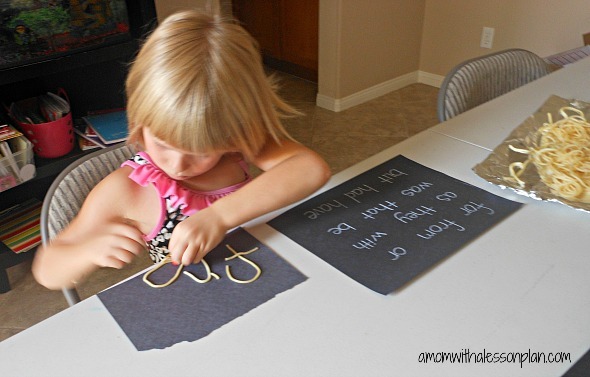 This spaghetti letters is a great idea, but a little early for my little ones (3-4) in the school year. I do appreciate all you share with us and you will probably see some of them along the way.